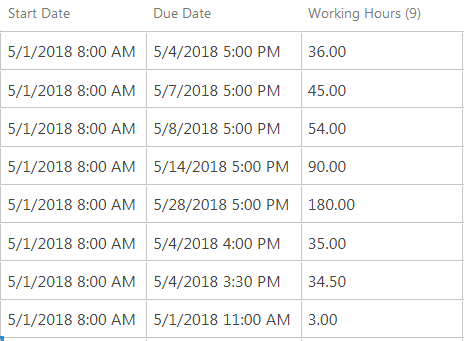 Trying to get some working syntax for calculating the difference in hours between 2 dates, Start Date [9am] and Due Date [5pm] for example. This yields the correct hourly difference when both dates are on the same day. However I need the formula to take the full difference into account! This is the syntax from a previous question, I've tried adapting it to my column names but i'm not sure if this is the correct formula to use or not. This will have no impact on a Calculated Column. This assumes all entries are M-F between the hours of 9 and 5. It does not work correctly for weekend dates or hours outside of 9 to 5.